Pepper Berkowitz leaned toward Indiana State University senior Chris Jones with a boldly-patterned shirt dangling from her hand. "This piece of art, and we don't just sell it now-a-days as a nice tunic," she said, "we're selling art. I think when you sell art, you can ask a little more in price." Later, as Jones practiced selling one-piece jumpsuits in the women's clothing showroom, he would make the same pitch for a sale. It was part of the Bridgeton native's education in the world of fashion. Indiana State fashion merchandising students spent a fall weekend in Atlanta immersing themselves in the ordering frenzy for spring fashions known as market. They worked in showrooms with wholesalers, who sell numerous designers' clothing lines to store buyers. Each fall, Indiana State professor Cheryl Kremer takes senior-level students to work at America's Mart - three buildings in downtown Atlanta with showrooms ranging from rugs to housewares to clothing. It is in building three, with 15 floors of clothing showrooms, where Kremer moves her students from classroom learning to real-world experience in fashion merchandising. "I believe in hands-on experience for students," said the assistant professor of family and consumer sciences. "And what better classroom than being in the real world during market week where they get to see what the new fashions are going to be for spring?" In the fast-paced world of fashion merchandising, it's the middle-man, the clothing wholesaler, who connects the designers to the boutique owners and, ultimately, to the woman who is looking for the shirt, the skirt, the jacket, the art in which to outfit herself. Shades of red, green, blue and black swirl by as sellers switch out tops, dresses, pants, skirts to display for buyers. Techno and pop beats spill out of each wholesaler's showroom underscoring the activity within as buyers spend thousands of dollars ordering what they hope women want to wear. Kremer placed her seven fashion merchandising students in different show rooms on different floors where they spent four intense days helping show and sell lines of clothes to buyers. 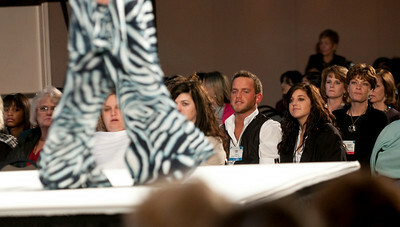 One student also worked the fashion show on the Saturday evening. "It's really hands on," said ISU student Alyssa Wertz, from Indianapolis. "When it gets really busy, I, by myself, am showing the entire line to buyers. It's really like a real job." "It's that front line," Jones said. "You're making connections with the customers. It's all about building relationships, and that's what I love." "I like this a whole lot, a lot more than I thought I would," said ISU student Danielle Cheever from Clinton, as she arranged a display of clothes by Mac and Jac. "I would like to get my hands in probably every aspect of the industry at some point." 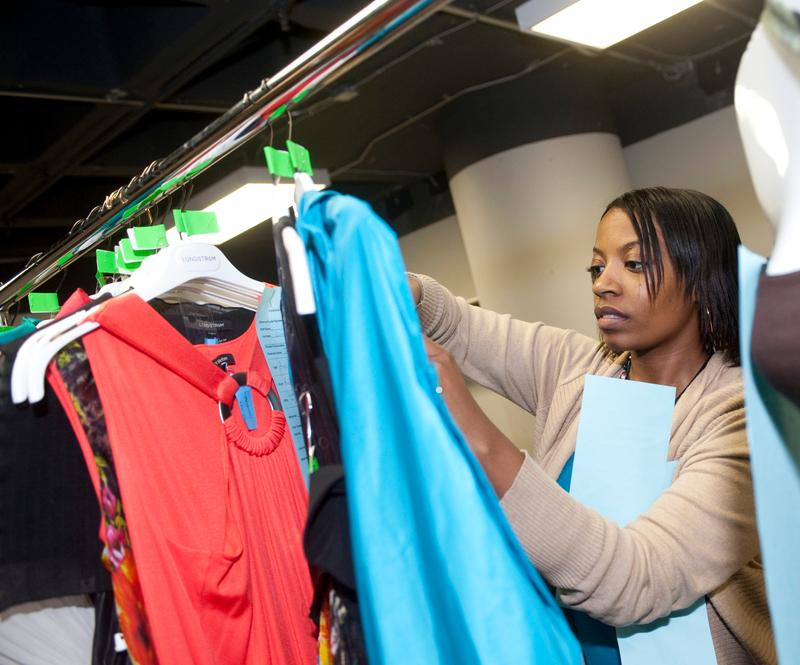 The showroom owners understand the importance of the students working the apparel market. "It gives them real life experience in the industry, what it would be like if they have to work with buyers who are here on business," said Lauren Brolmann, owner of the Ward and Ward showroom. "It's high paced. It's fast." "It really does give them a hands-on experience to know from day one how it starts," said Mark Garland, who owns a showroom that carries his name. "ISU students have been working with us for 10 years. It's the only college we've ever worked with." Gaining that knowledge of buying and selling instills confidence and is one reason Berkowitz allows students to sell in her showroom, Pepper's Collection. "I have my students sell because I think everybody should have that presentation. Of course, it's nerve wracking when you have a buyer sitting there and you've never really sold," said Berkowitz, who has mentored numerous ISU students in 10 years. The students understand such an opportunity to work in the fashion world is irreplaceable. "A textbook can only teach you so much," said Andrea Lozano, a senior from Plymouth, during a break from showing clothes for a buyer. Actually working in the field with professionals adds a new dimension to the learning, she added. Rilee Feaster, of Bradenton, Fla., thinks that book knowledge and real world experience combine for the best education. "When you have both aspects of hands-on and reading material, then you can just put it together and then your knowledge will be the greatest it can be," she said during a short break from assisting Carol Turner with showing her designs. That combination is why Kremer began taking students to work in Chicago and Atlanta to assist wholesalers with selling lines. "A lot of students have already worked retail, but this is the wholesale side of it. They get to work with buyers as their customers instead of the ultimate consumer when they are working retail," she said. "They get to meet so many different individuals, whether it's a national sales rep or they get to meet with the designer of the line." Students met with designer Simon Chang, whose creations are regularly featured in fashion magazines. Chang, who was recently honored with the Order of Canada medal for his business and philanthropic achievements, visited Atlanta for the mart's Montreal Collections Fashion Show, in which his designs were featured. Chang advised students to get into every aspect of the industry. "Don't think it's beneath you to do. Smell and touch the industry," he said. "You learn something." He also said those going into the fashion industry must love it because of its demanding nature. "It should never be work," he said. "People say, ‘Are you a workaholic?' I say, "No, I play. I play!'" ISU student Stacey Morris of Gary worked behind the scenes in setting up Montreal Collections fashion show, picking up outfits from different showrooms before tagging the garments for the show. "I like behind the scenes stuff, the production and getting it all together and seeing it all come together and knowing you had a part in it is really enjoyable for me," she said as she hastily pinned tags to garments. As Morris worked to help organize the clothes for the style show, she knew was working toward her future goal of being a stylist. "You have to learn every aspect of everything," she said. During the weekends working the Atlanta and Chicago markets, some students ultimately find their next steps in life. "I didn't really know what my job options were," said ISU student Rochelle Bullerdick, of Brazil, who began college as a pre-law major before switching to fashion merchandising. "It's great for me to be in this class, because not only am I seeing what wholesaling's like, but I'm seeing what it's like to be a buyer." From her experience, Bullerdick thinks she would like to be a buyer - the person going to wholesalers and selecting what fashions will be sold in stores. "I'm working with buyers so I get to see how their thoughts work and how they function and how they make decisions on what they want to buy," she said. "I'm learning so much more than I ever thought I would about buying." Indiana State fashion merchandising students spent a fall weekend in Atlanta immersing themselves in the ordering frenzy for spring fashions known as market.